Amacsoft PDF to Text for Mac will help you convert PDF to Text document on Mac OS X, so that you can edit and reuse your PDF content. This PDF to Text Converter for Mac converts PDF to Txt with fast speed, also it can convert many PDF files to text files at one time.Quick, easy and with good accuracy;2 conversion modes - Batch and Partial conversion mode;Standalone Application, no need Adobe Acrobat. Best PDF to Text for Mac supports to convert Adobe PDF files into one text file on Mac with very fast converting speed and good accuracy. Support to convert any specific pages by setting the "Page Range" to specify the pages if you don't wish to convert the entire PDF file to Text documents on Mac. Even it only extracts plain text from PDF to Text, Amacsoft PDF to Text for Mac will preserve the formatting well from original PDF files. You can easily preview the PDF document page by page in the preview window to decide to whether you want to convert the PDF files to Text. 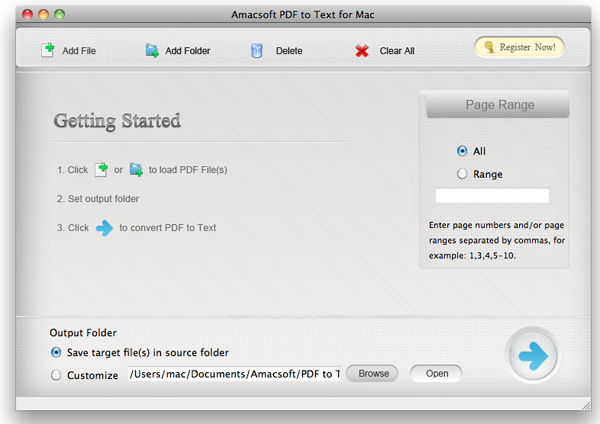 Amacsoft PDF to Text for Mac is a small and simple PDF conversion tool, it is simple to operate, just import PDF files and click the "Convert" button to begin! Qweas is providing links to Amacsoft PDF to Text for Mac 2.1.0 as a courtesy, and makes no representations regarding Amacsoft PDF to Text for Mac or any other applications or any information related thereto. Any questions, complaints or claims regarding this application Amacsoft PDF to Text for Mac 2.1.0 must be directed to the appropriate software vendor. You may click the publisher link of Amacsoft PDF to Text for Mac on the top of this page to get more details about the vendor.